While advocates continue to focus on the word ‘light’, we really should focus on the word ‘RAIL‘. 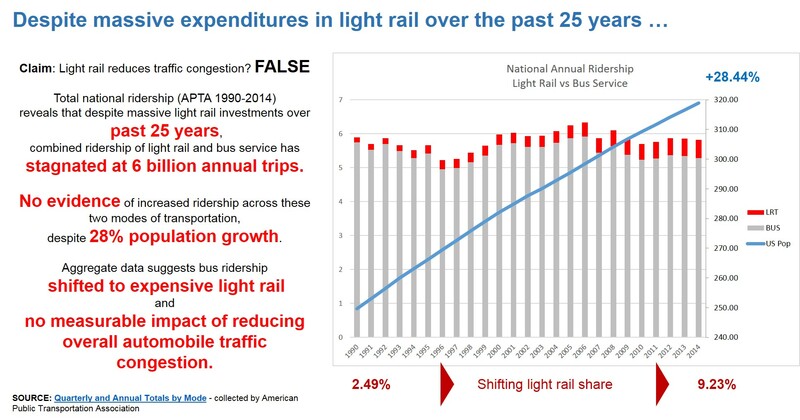 Yes, Light RAIL Transit is not a freight train (with infrequent daily crossings). However, the 100-ton Light RAIL Transit will snake thru communities on steel wheels and steel tracks, unable to swerve or stop quickly like other vehicles on the road – while crossing each and every crossing gate ~150 times on a typical work day !!!! These Light RAIL Trains ride on steel wheels on steel rails. Even if the brakes are the best and can stop the wheel completely (without derailing), the physics of steel sliding on steel do not change the physics of a 100 ton train’s momentum. Light RAIL Trains traveling at 35 MPH with full brake will travel ~ 428 feet in less than 10 seconds. More than the length of a football field. “All of these accidents point out the key flaw in rail transit: It is simply not safe to put vehicles weighing hundreds of thousands of pounds in the same streets as pedestrians that weigh 100 to 200 pounds and vehicles that typically weigh a few thousand pounds. Heavy rail (subways and elevated) avoid this flaw by being completely separated from autos and pedestrians, but are still vulnerable to suicides. Light rail, which often operates in the same streets as autos, and commuter trains, which often cross streets, simply are not safe. Aside from being lighter than railcars (and thus less likely to do harm when they hit you), buses have the advantage that they can stop quicker. Rubber on pavement has more friction than steel wheel on steel rail, and the typical bus has many more square inches of wheel on pavement than a railcar. No matter how good the brakes on the railcar, it is physically impossible for it to stop as fast as a bus, for if the brakes are too good the wheels will just slide. Consider, that According to the National Highway Traffic Safety Administration (NHTSA) at U.S. DOT: Three out of four crashes occur within 25 miles of a motorist’s home. 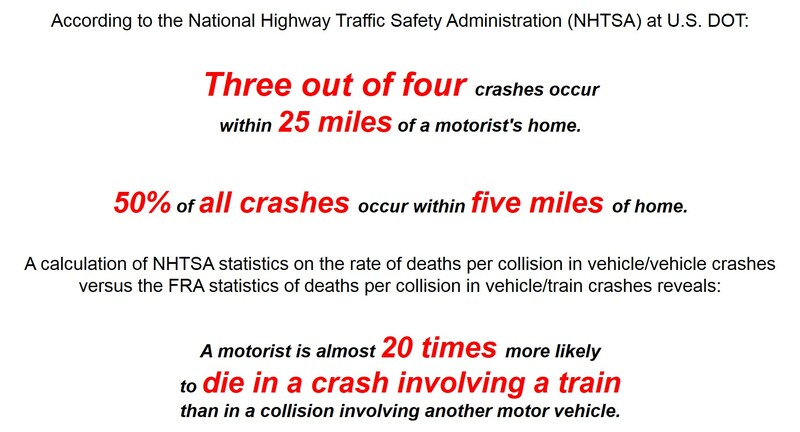 Fifty percent of all crashes occur within five miles of home. 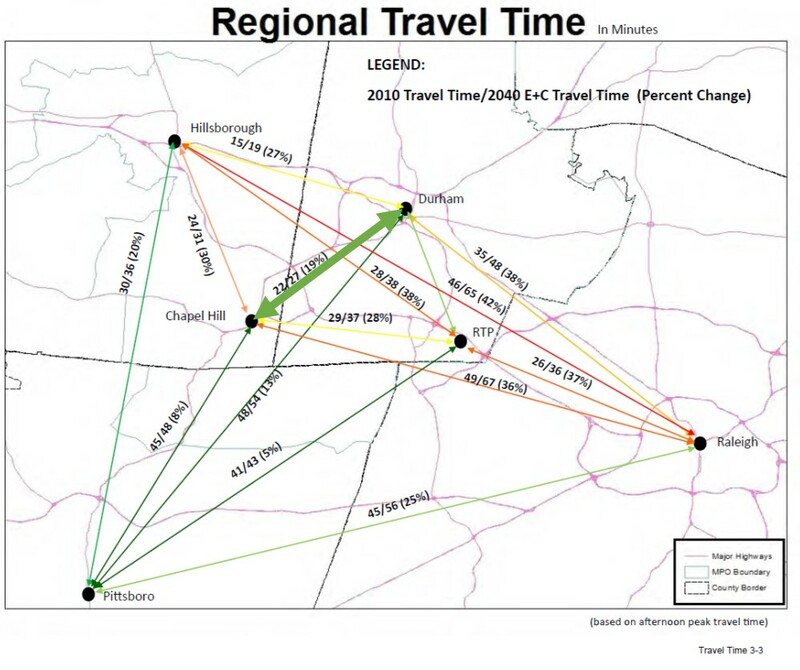 Or one can merely view recent incidents and fatalities in other Light RAIL Transit projects across the nation. 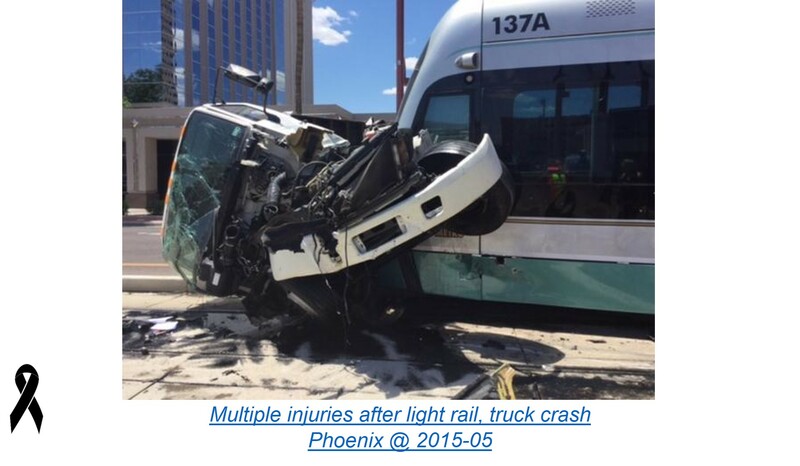 Light RAIL Transit with at-grade crossings are NOT SAFE. Just GOOGLE “Light Rail Accident” or review this list or this list. This entry was posted in myth and tagged Chapel Hill, DOLRT, Durham, Light Rail, LRT, Myth, NC, Raleigh, Safety, Train on August 28, 2015 by admin.